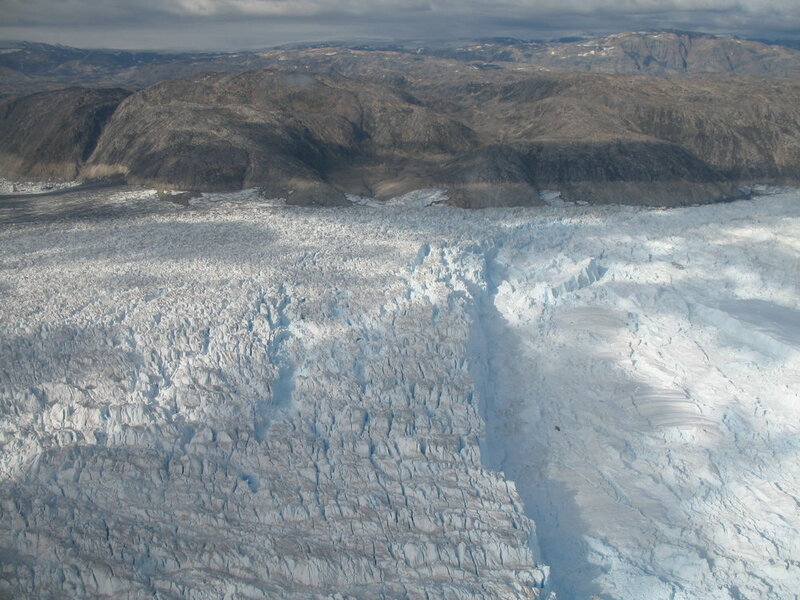 Glacier - Fjord Dynamics in Greenland Score one for the seals. In addition to using high-tech equipment and sophisticated research techniques, researcher Gordon Hamilton (University of Maine, Orono) will also get a hand (fin?) from the ocean-dwelling creatures for his new NSF-funded collaborative study. Hamilton and a team of glaciologists and oceanographers will spend the next three years studying glacier-fjord interactions at Helheim Glacier in east Greenland to better understand how warm ocean waters are affecting the dynamics of outlet glaciers draining the ice sheet. The seals, tagged with small sensors that record position, depth and temperature, will collect data about what goes on beneath the ocean’s surface. Above water, the team will investigate the mutual relationship between the glacier and the ocean through field season surveys and year-round data collection in order to better understand how ocean currents and heat affect the ice sheet. The research team will use these and other data to map the circulation and properties of the fjord and adjacent offshore waters, and how these characteristics change with time. We talked to Professor Hamilton about his upcoming research. PFS: Given your new NSF grant to explore ice sheet / ocean interactions and their influence on glacier motion, what did you think of the Pritchard article in Nature this week, suggesting "the most profound changes in the ice sheets currently result from glacier dynamics at ocean margins?" Gordon Hamilton: It's a nice paper because, for the first time, it takes a quantitative look at the entire coastlines of Greenland and Antarctica and shows that near-coastal changes are happening everywhere, not just in a few places. It really points to the importance of ice--ocean interactions in playing a major role in the health of the ice sheets. PFS:The Pritchard article also mentions that "accelerated melt" is another relatively unknown area of glaciology. Can you explain what that is, and how your study may shed light on it? Gordon Hamilton: In this case, they are referring to “submarine melting” which occurs wherever glacier ice comes into contact with the ocean (outlet glaciers and ice shelves, for example). Basically, any time you have ocean temperatures above the local freezing point (i.e., the freezing point adjusted for salinity and density), you have excess heat available to melt glacier ice. Because the ocean can carry so much more heat than the atmosphere, submarine melting can be much more effective than surface melting but it is very difficult to observe because of the obvious challenges in accessing the underwater portions of glaciers. Our work will help quantify the submarine melting component because we will be making direct measurements of ocean heat content, and the rate at which it is replenished, in the waters adjacent to a large outlet glacier. PFS:The lack of knowledge about glacier/ocean interactions represents a large gap when it comes to modeling the impacts of melting ice sheets. How will your research improve modeling, and what specifically will you be looking for to develop a better understanding of these mechanisms? Gordon Hamilton: Very true. There are just a couple of measurements of heat content and circulation in Greenlandic fjords, and most of these measurements have been isolated samples. We deployed some moored instruments as part of our pilot project, so we are just beginning to get a handle on how one-off measurements compare with a full year's worth of data on fjord behavior. Seasonal and interannual variability is likely to be quite large, so we really need to quantify it so we can understand how much heat gets transported to these glacier fronts, when it gets transported, and if the rate of heat transport is changing with time. We will link these changes to observations of how the glacier behaves. For example, does the glacier calve more icebergs when the ocean is warmer, and does that cause the glacier to flow faster? These are basic things to know if we want to model how future ocean changes might affect the ice sheet. PFS: Why did you choose Helheim Glacier? Gordon Hamilton: Helheim is important because it drains about 5% of the entire ice sheet, it recently doubled its rate of mass loss, and because it discharges freshwater (in liquid and solid iceberg form) to a sensitive part of the North Atlantic Ocean where global ocean currents are formed. PFS:Do the Pritchard et al findings potentially alter your research plan? No, not really, but they do provide extra motivation in case anyone doubted the role of the ocean in potentially controlling the fate of the ice sheet. PFS: On a lighter note, you have Greenlandic colleagues who will outfit seals with sensors to collect information on ocean temperature and depth. Can you tell us more about the logistics of this? What do you expect to learn from the seals? Any chance you can outfit them with cameras, as well, so we can get seal-cam pix of the fjord or ocean? Gordon Hamilton: This is something new for us, but it's a fairly standard technique for marine biologists who want to understand how and where seals dive for food. The tags will measure depth and water temperature. Seals are much more effective at making these kinds of measurements than scientists because they live there year-round and are continually diving for food, whereas we only visit the area for short field seasons. We use them as oceanographic platforms to build up a really long and detailed record of oceanic conditions. Each tag should last for a few months, so it will allow us to look at seasonal patterns in heat content of the offshore waters adjacent to the Greenland Ice Sheet. Plus it makes a great collaboration for glaciologists and oceanographers and marine biologists to be working together. I’m not sure about the practicalities of installing seal-cams, but we do plan to install cameras at a few key points overlooking the glacier and fjord. The cameras will have telemetry capability, so we should be able to monitor fjord conditions in near real-time. OFS: As part of your outreach program, you're planning to present a non-technical report to the Greenlandic community. How might the report benefit them? Gordon Hamilton: In southeast Greenland, where we are working, the way of life for a huge percentage of the population is dependent on hunting and fishing in the coastal and fjord waters. These waters are starting to change character, so different species of fish (warmer-water species) are moving in and other types are disappearing. Local fisherman have to adapt to these conditions. Also, the warming waters are probably playing a role in the recent speed-up of the many of the ice sheet's outlet glaciers, meaning there are more icebergs in the fjord year-round. Icebergs are a real hazard to safe travel for these hunters, so they will be very interested in our predictions for future conditions. PFS: You've done extensive glaciology in Antarctica. How does working in Greenland compare to your antarctic research? Are you doing glacier/fjord studies on the southern continent as well? Gordon Hamilton: This project just deals with Greenland, but some colleagues have recently started looking at similar processes in the Amundsen Sea of West Antarctica. And we are thinking about starting related work beneath the Ross Ice Shelf, close to where several large outlet glaciers enter from East Antarctica. Working in Greenland is quite different from Antarctica. For one, real populations of people live in villages around Greenland’s coast; Antarctica only has scientific research stations. So the local population provides an interesting cultural perspective. Plus it is just a few hours from the east coast of the US, meaning it is a lot easier and quicker to conduct fieldwork there than in Antarctica.